There are days, and sometimes weeks and months that I wake up every morning feeling defeated before I get out of bed. Today was no exception. I can probably blame the ultra-cold weather of the past 3 days (-8F for most of yesterday), but I think that’s only part of it. This past year, I wrote a song. My first worship song ever, in fact. I called it “Quiet Now”, and you can listen here. This is a deep need inside us all, and one I’m so bad at. This is where songs – worship songs in particular – can be truly valuable. It’s possible to notice the disparity between your life and the songs you sing and decide that you shouldn’t sing them because you’re not being honest to do so. I can see why people feel this way, and I suppose it’s a step ahead of singing songs without any thought behind what you’re singing, but I think it’s a bit shy of the mark. I believe worship songs are like scripture is in most places. It’s not meant to be a weight around your neck, showing you how terrible you are. It’s meant to be a reflection of where you’re meant to be, and where you can get to when you really live a God-breathed life – one that lets Jesus shine through moment by moment. I guess the point is, your life and songs, public and private, are not meant to be lived apart from your Father. Living as close to Him as possible is really the point, and learning how to be quiet and listen is a good first step. 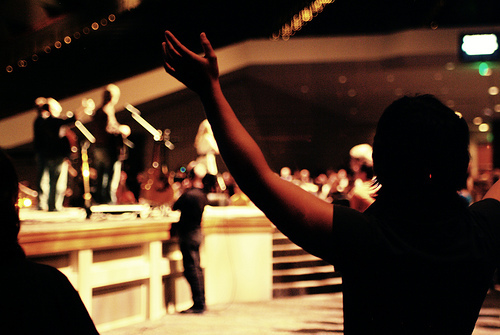 This entry was posted on Tuesday, January 7th, 2014 at 8:58 pm	and posted in Why Worship. You can follow any responses to this entry through the RSS 2.0 feed.